Nut Scrub is an all natural professional hand cleaner designed to clean the grimiest hands and keep them feeling great. I'm an engineer, and bought this to put by the sink in the office at work. Overall, I am very happy with this purchase. I use this at work and for a hand cleaner, it has one of the cleanest fragrances on the market. No chemical smell. The abrasiveness is perfect. The product leaves your hands feeling moisturized and not dry, unlike other chemical cleaners. This stuff is fantastic. Washes off ANYTHING! Diesel fuel, dirt, grease. Literally anything and everything. Doesn't dry out your hands. Zequip has the best pricing and cheapest shipping I've found on this item. Great service. I love this scrub best hand cleaner,I work in a machine shop and this keeps my hands from drying and cracking and still removes all the dirt but my only complaint is it made me pay for one day shipping but it did come in one day. 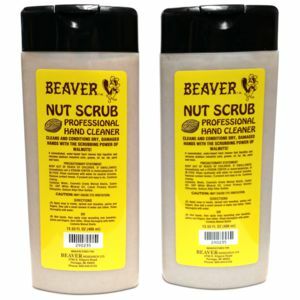 Nut scrub does double duty - it cleans your hands very well and leaves your hands nice and soft. We love it! Home use and have found nothing that's works better Love it !